After seeing the post on Graduation Announcements and Invitations, a friend reached out asking ‘what to get’ for the graduates in her life and how much to spend. Her kiddos are much younger, and she wanted to know what would make a good gift and how much she should spend. I think it totally depends on your personal situation as well as the relationship with the graduate when it comes to how much to spend. Keep in mind it is the thought that counts and you don’t have to break the bank to show the graduate how happy you are for them! Personalized Laundry Bag – If you’re crafty and can sew, these are easy to whip up and you can have them monogrammed for a personal touch. I know many students who carry their laundry bags for years to come! Personalized Bath Towels – Having their name on their towel makes it easy to identify. Velcro towel wraps make a nice gift too! Nice Picture Frame – is a great gift that the graduate can take to school and help to decorate and brighten their dorm room. 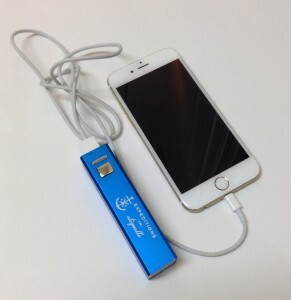 Portable Phone Chargers – these make great gifts for college kids when they out for the day and every plug they come across is already taken. Gift cards – Gift cards make nice gifts for both High School and College graduates. Whether it’s a gift card to a box store where they can stock up on supplies for their dorm or apartment, or a Gas card to help fuel up when cash is tight, gift cards seem like an ‘easy out’ but if you know the graduate needs some general store items, this can be a huge help to their already strapped budget! A nice engraved pen – not only will this be a gift they will cherish for a long time to come, but it will also make a great impression during interviews they may be going on soon! Personalized Stationery – this is something that every graduate needs, but doesn’t want to spend his or her own money on! The stationery can be used for thank-you notes after an interview, and believe it or not some kids still write good old-fashioned thank you notes! At least they should if they want the job! Tool Set – As adults, we know there is always some DIY task that needs to be done around the house and how important our tools are! Whether it’s hanging a picture, tightening a water faucet, or just about any other little ‘honey-do’ trick we can do ourselves, having those tools in a compact tool kit, is a huge help! Whatever you choose to give, make sure you spend some time on the presentation. Wrap it nicely and include a handwritten note of support and encouragement! This is a big time in their life and a huge transition for the graduate; your kind words may just be the support they need to remind them they can do it! Feel free to leave a comment below and share your ideas!